Sometimes the simplest things are the most delicious. 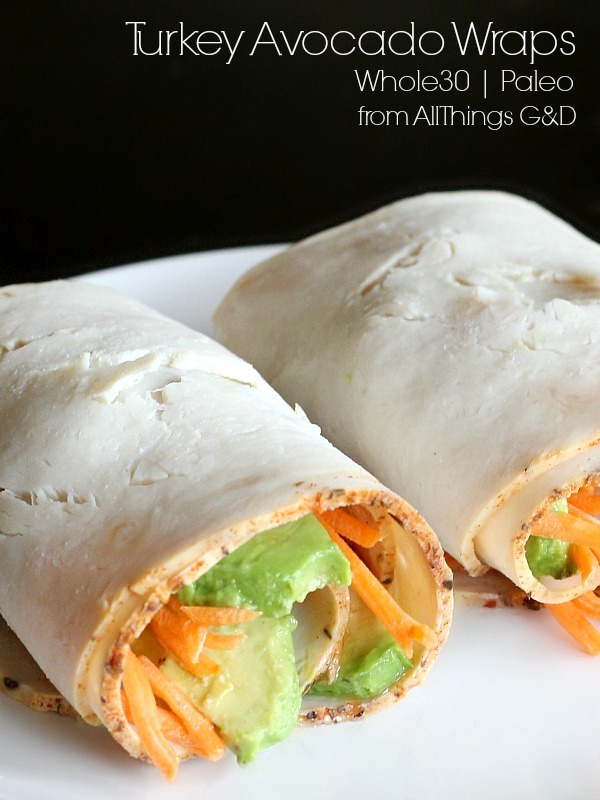 Whole30 and Paleo-compliant Turkey Avocado Wraps. Now roll it all up, and enjoy! There are some great Whole30 recipes for vinaigrettes and dressings found in the book It Starts with Food and online, or you can use a Whole30-approved Tessemae’s Dressing. My current favorite is Tesseamae’s Zesty Ranch (found at Whole Foods in the refrigerator area of the produce section), but feel free to play around with dressings and flavors that appeal to you. I’ve yet to drizzle something on these wraps that hasn’t tasted great! 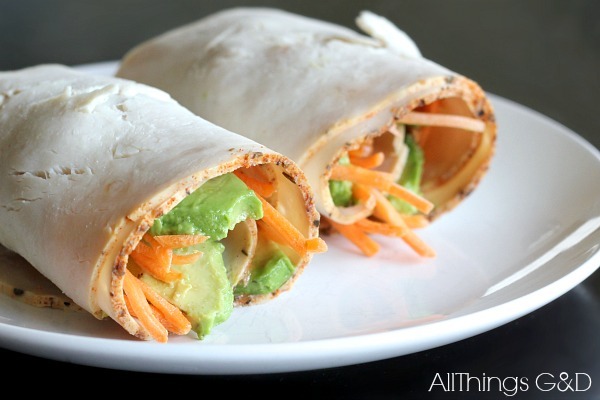 These Turkey Avocado Wraps are one of the quickest, easiest and healthiest recipes you can throw together…and mmm, are they so good! 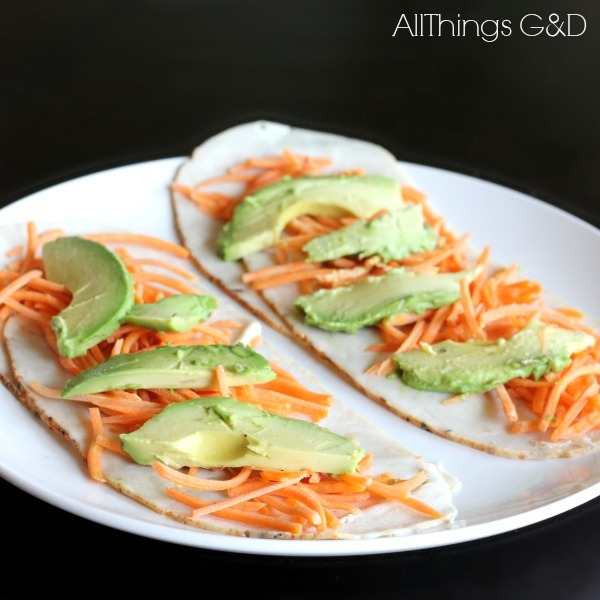 The combination of the creamy avocado with the sweet, crunchy carrots makes this wrap irresistible. I’m telling you – try these and you’ll be hooked. What are some of your favorite Whole30 recipes for lunch? My pleasure, Debbie! Thank you so much for your comment. I hope you like them! Yep, these are my new favorite lunch! Thanks for introducing me. Pics look awesome! Thanks Beth! So glad you ended up liking them as much as I do – I was worried I might be over-selling them, haha. that looks yummy, I must try!! Thank you, Jodi! I hope you give them a try and enjoy them as much as I do! Where did you find Whole 30 compliant turkey slices? Hi Carissa. I used Applegate Naturals oven smoked turkey breast – the kind you get sliced at the deli, NOT the prepackaged slices. I looked at the label for those and it has carageenen (sp?) which is on the definite Whole30 avoid list. At the time of my last Whole30, Applegate Naturals turkey breast that you get sliced at the deli (NOT the prepackaged slices) was Whole30 compliant. It was recommended by Melissa Hartwig (one of the founders of Whole30) as the safe kind of turkey to use. Of course, brands may change their ingredients at any time, so it’s always best to check for yourself, but be sure you’re considering the whole turkey that gets sliced at the deli for your selection – NOT the prepackaged Applegate Naturals slices (which does have carrageenan). Hello! This looks delicious! What Whole30 vinaigrette dressing do you use? Thanks! Great question, Mary! My favorite for this wrap is Tessemae’s dressing in Zesty Ranch. where can I find whole 30 compliant turkey slices? At the time of my last Whole30, Applegate Naturals turkey breast that you get sliced at the deli (NOT the prepackaged slices) was Whole30 compliant. It was recommended by Melissa Hartwig (one of the founders of Whole30) as the safe kind of turkey to use. Of course, brands may change their ingredients at any time, so please check for yourself, but be sure you’re considering the whole turkey that gets sliced at the deli for your selection – NOT the prepackaged Applegate Naturals slices. (The prepackaged slices have carrageenan as an ingredient which is not Whole30 compliant). Applegate Naturals. Hope that helps!